Melfann's domain: Register for POEMS 2.0 Stock Challenge! I normally keep my work separate from my blog but this is my pet project at the moment and I'm so proud of it. All the months of hardwork, sweat, tears and frustrations have crystallised to this! We managed to get a Mazda 6 for our Grand Lucky Draw and you can earn extra chances to win it just from entering the POEMS 2.0 Stock Challenge. What are you waiting for? There's no downside to registering AND this Trading Competition is open to everyone. Yes, we've made it international. 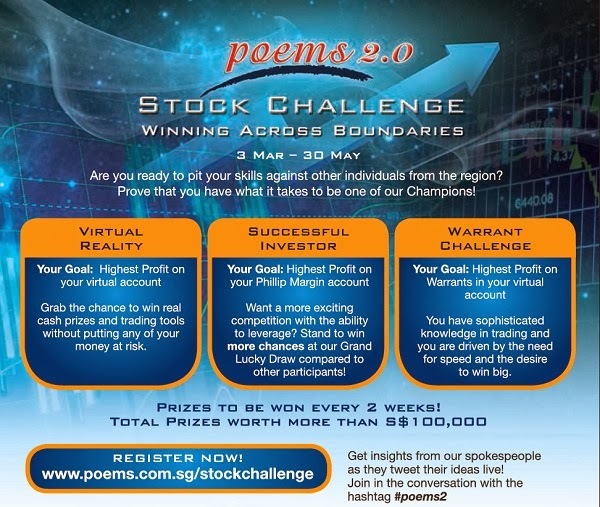 So don't be shy and just visit www.poems.com.sg/stockchallenge today!